It started with these tomatillos. 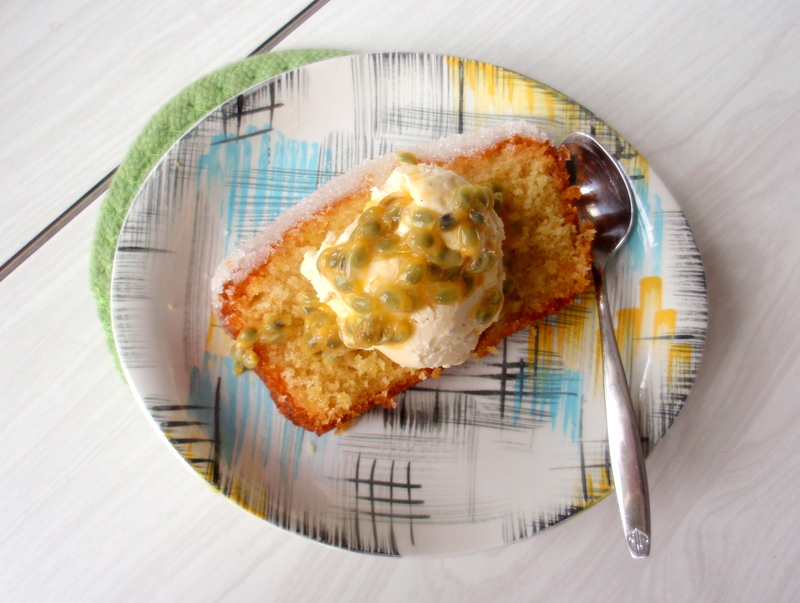 Well actually, it started before the tomatillos: it started with this blog post. Or you could say it started even before that; all summer I’ve been keeping an eye out for tomatillos, with no luck whatsoever. I’m sure once, years ago, I saw them at Moore Wilson’s, but whether I missed them this year or they weren’t there I’ll never know. 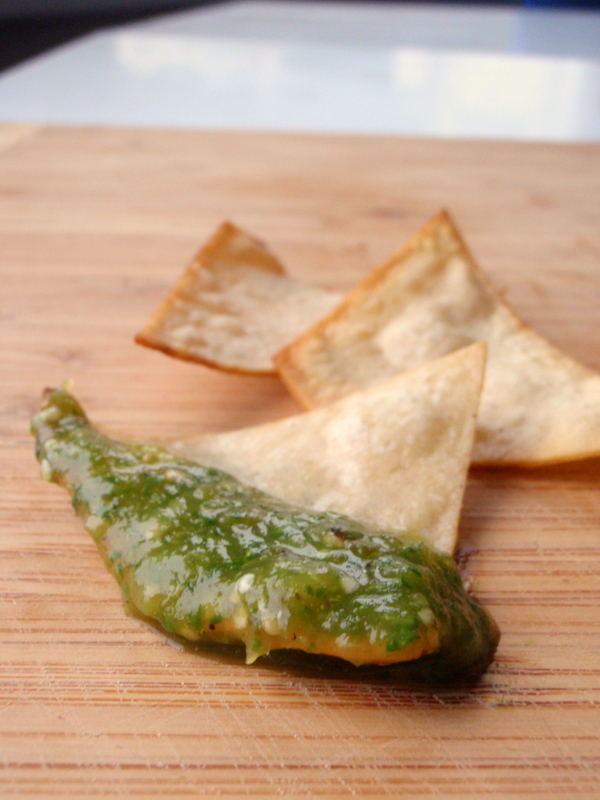 Anyway, I’ve been hanging out for a good salsa verde, the Mexican kind, with tomatillos and jalapeños and coriander. The kind that came standard with a bowl of complimentary, freshly fried tortilla chips at the late-night taco shops I used to frequent as a teenager in suburban Chicago (which were way better than I just made them sound, by the way). So when Sue blogged about her tomatillos over at Five Course Garden, one thing led to another and I ended up having a cup of tea and a chat in her hot-cross-bun-scented kitchen last Saturday afternoon, and left with a bag full of tomatillos (as well as parsley and sorrel that went into another kind of salsa verde altogether, and a wee passionfruit) she kindly donated to my tomatillo-deprived kitchen. Rather than baking them in the oven I ended up using the technique from this recipe (for chilaquiles rojos), where the chips are tossed in a pan of bubbling sauce and cooked till just soft. 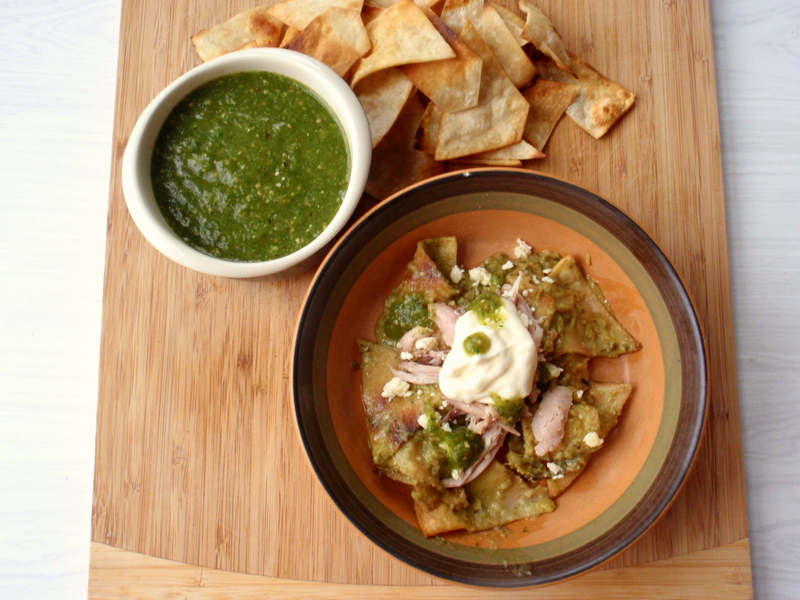 Once I had all the components ready it only took a few minutes to put together, simmering the fresh chips (there aren’t many snack foods better than freshly made tortilla chips) into the bubbling green sauce rounded out with sour cream and chicken stock, slopping the whole thing on a plate, topping with chicken and cheese and sour cream and more salsa. It took even less time to devour. I wasn’t sad then, because I still had plenty of salsa left. 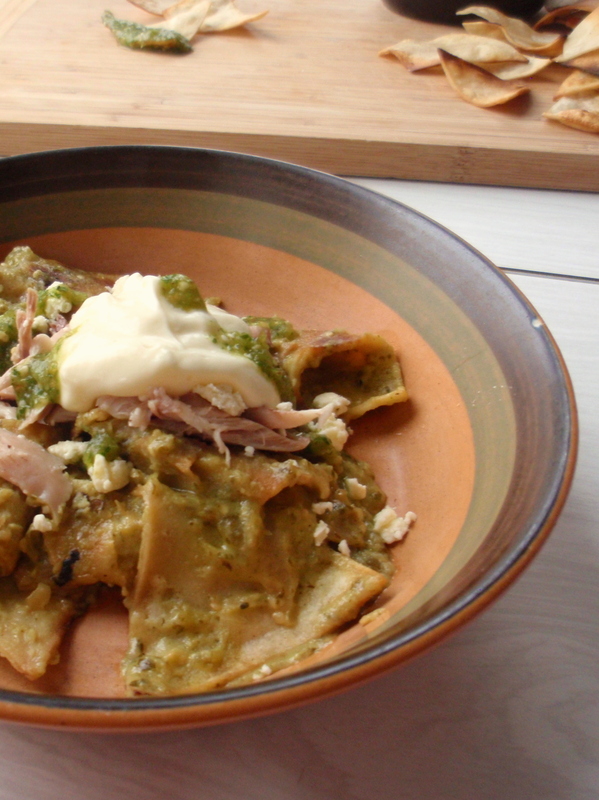 But by the following night it was all gone – used up for the best enchiladas verdes I’ve ever made – and I had that twinge of guilty longing you get when you’re enjoying something with no guarantee you’ll have it again, at least for a long time. Bittersweet, like the last meal on an overseas holiday. I wanted every bite to last forever. I also wanted more salsa to magically appear so I could make more chilaquiles. Oh well. Maybe next year. So. 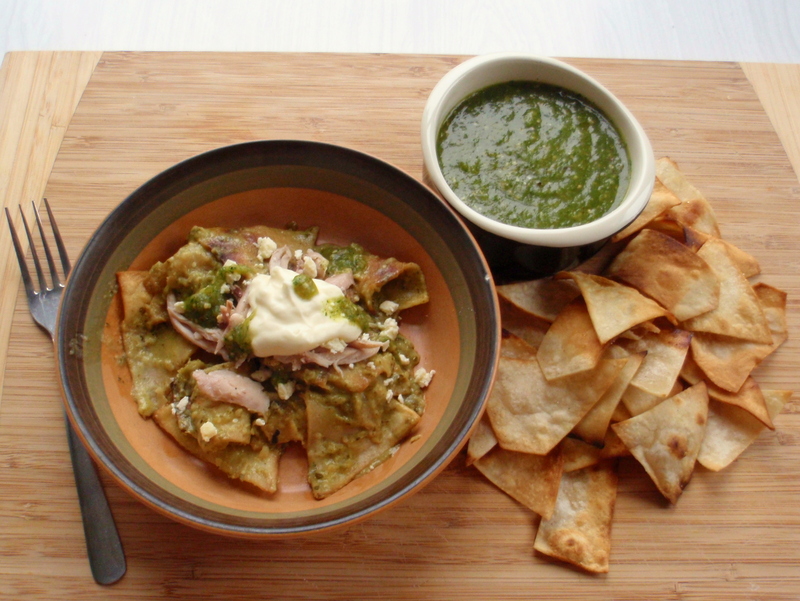 If you’re lucky enough to have a good source of tomatillos**, make this before the season’s over for the year. Otherwise I’d suggest planting some next spring (it’s what I’ll be doing, and they seem to grow well here), and then making this salsa. 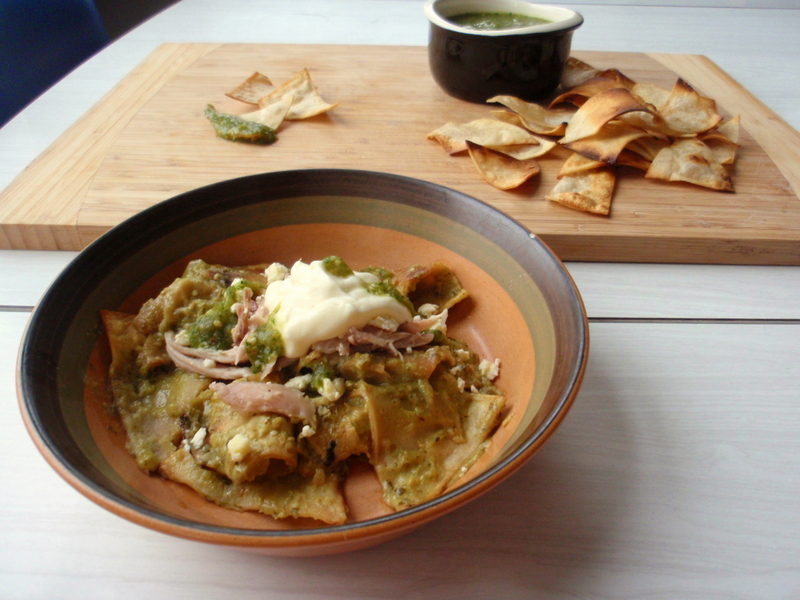 And then: these chilaquiles. I couldn’t say this enough, but many, many, many thanks to Sue at Five Course Garden for giving me these tomatillos. I was the happiest person in the world eating this. 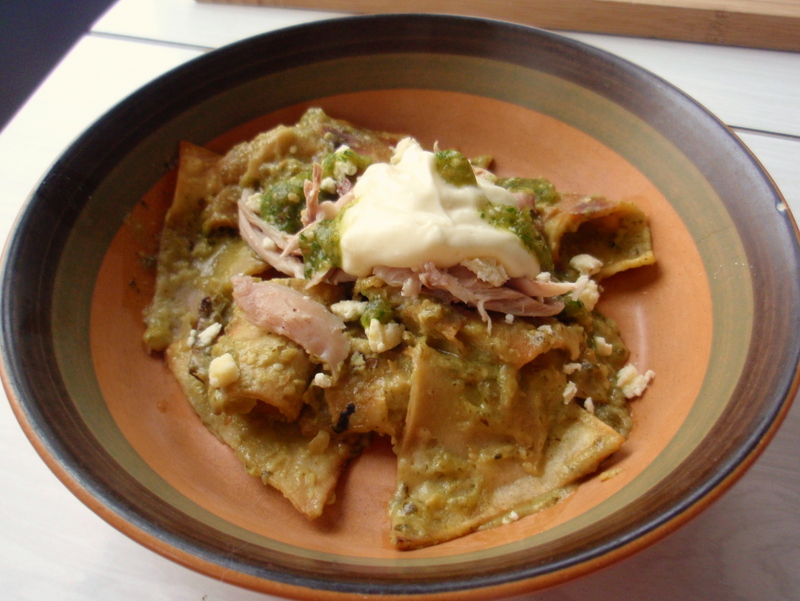 *Looking through internet recipes, it seems there are as many variations on chilaquiles as there are breeds of dog. Er, that makes it sound like this recipe somehow involves dogs, which I can assure you it does not, but you know. Lots. And I haven’t been to Mexico (though I did grow up in a city with a big Mexican population) so I can’t vouch for authenticity at all. But whatever. These are damn good. **I’ve seen cans of them in Moore Wilson’s but at $9 a pop they’re not cheap. 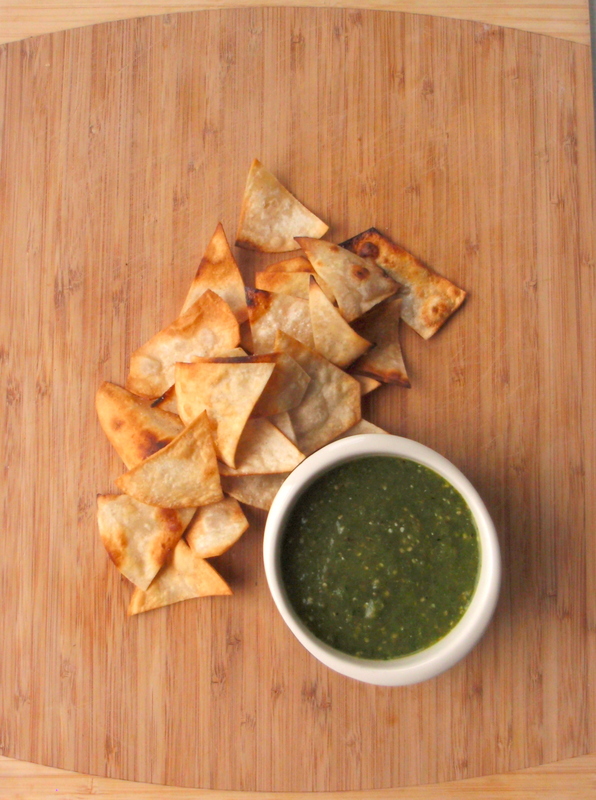 If you are reading this from a more tomatillo-acquainted area, I am so jealous of you. Preheat the grill/broiler setting on your oven. 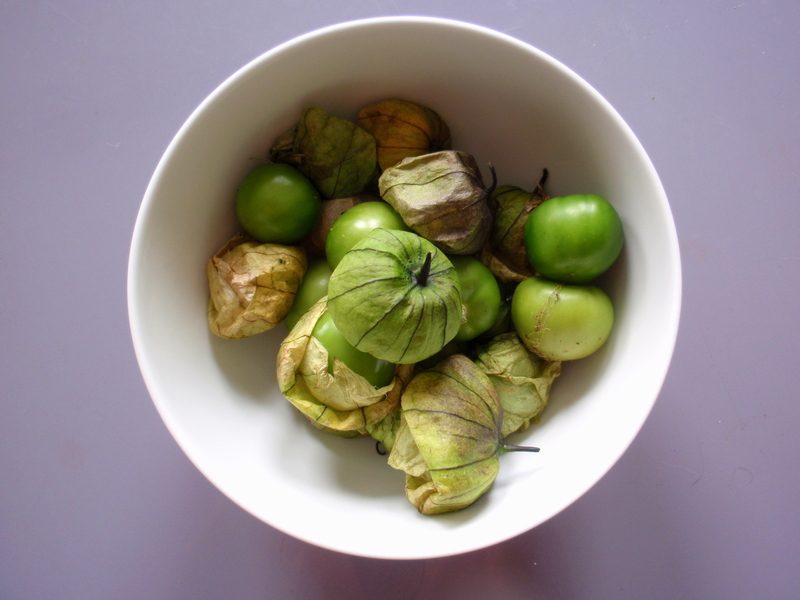 Take roughly 500g tomatillos – remove the papery outer husks and rinse (they’re sticky) – and slice in half. * Place on a tinfoil-lined baking tray, cut side up, along with 2-4 jalapeño peppers (depending on how spicy you want the end product). ** Pop this in the oven right on the top rack; cook for a few minutes until the tomatillos are soft and almost-burnt and the jalapeños are charred (don’t worry, you’ll be peeling off the charred skin). Peel the jalapeños and remove the seeds if you prefer a milder salsa. Put the tomatillos, jalapeños, a big handful of coriander, 1/2 a chopped onion, and 2 cloves garlic into a blender. Add about 1/4 cup water and a bit of salt in there as well, and purée until it reaches a sauce-like texture. *** Add more water if you want a thinner salsa; season with salt, let chill for at least 30 minutes so the flavours have a chance to mingle a bit. 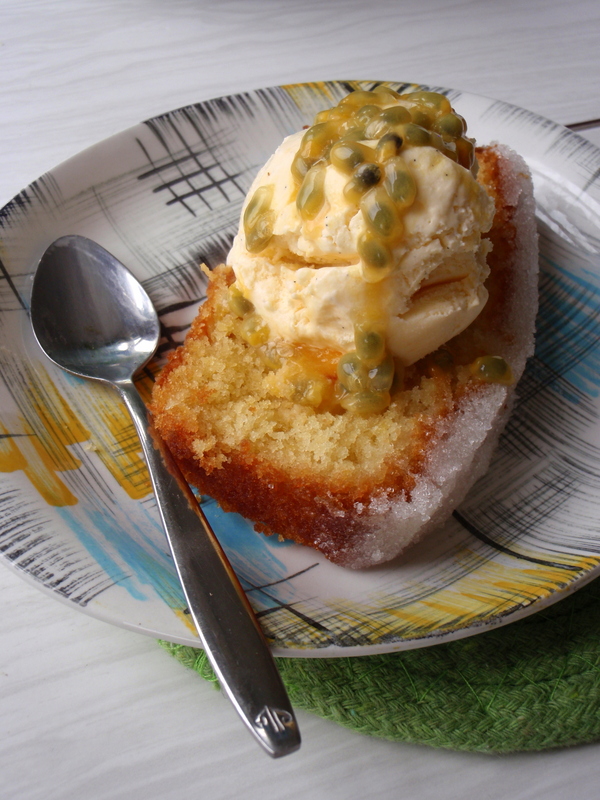 This recipe makes quite a bit – it says 2 cups but I swear I got at least 2 1/2, maybe closer to 3. *I don’t know why I did this instead of leaving the tomatillos whole. Maybe so they’d cook faster. Anyway, you can skip this if you want, but you may need to leave them in the oven a bit longer. **I used 4, and left the seeds in; the salsa had a big roundhouse-kick heat to it but wasn’t too bad for my tastes. I like spicy food, though, so if you’re not big on chillies you may want to use less, or add them to the blender one at a time. ***you can make this smoother or chunkier depending on your preference. 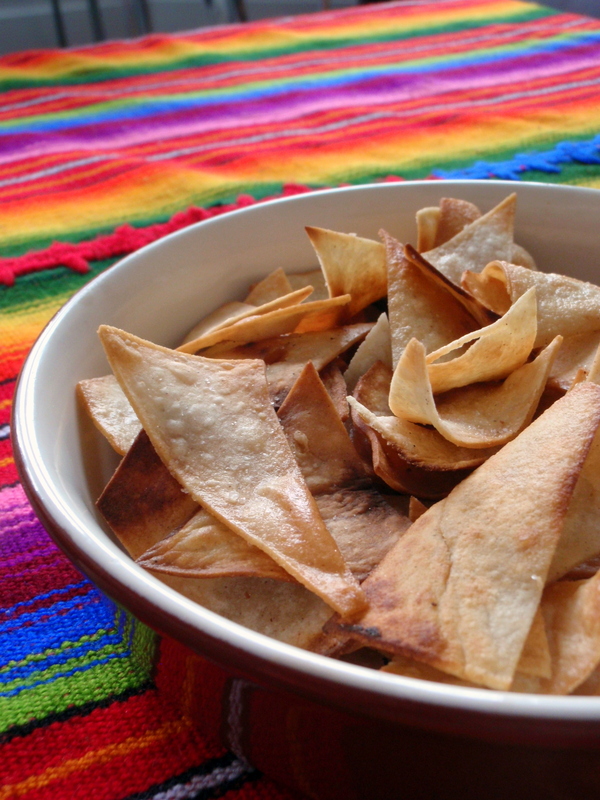 This isn’t so much a recipe as it is a method: cut corn tortillas into triangles, fry in a bit of hot oil till golden, drain on paper towels. Sprinkle some salt on them while they’re still hot. Eat as soon as they’re cool enough to handle. Save some for the chilaquiles. 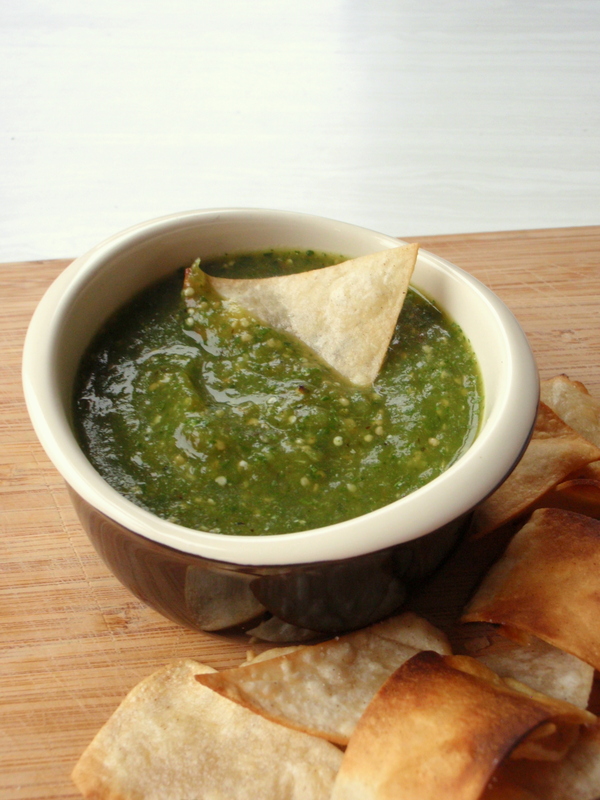 Heat a bit of oil in a skillet; when hot, add roughly 1 to 1 1/2 cups salsa verde. Give it a good stir while you let it heat up so that it’s nice and bubbly, then stir in 1 cup chicken stock and 1/4 cup sour cream. Taste and adjust seasoning as you see fit, then bring back to the boil. Add roughly 120g tortilla chips (I didn’t weigh mine. You could easily just eyeball it depending on how much you think you’ll eat) and simmer for about 5 minutes until just soft. To serve, top with warmed shredded chicken (leftover roast chicken would do perfectly)*, cheese (I used a bit of crumbled feta and goat’s cheese), sour cream and a bit more salsa. 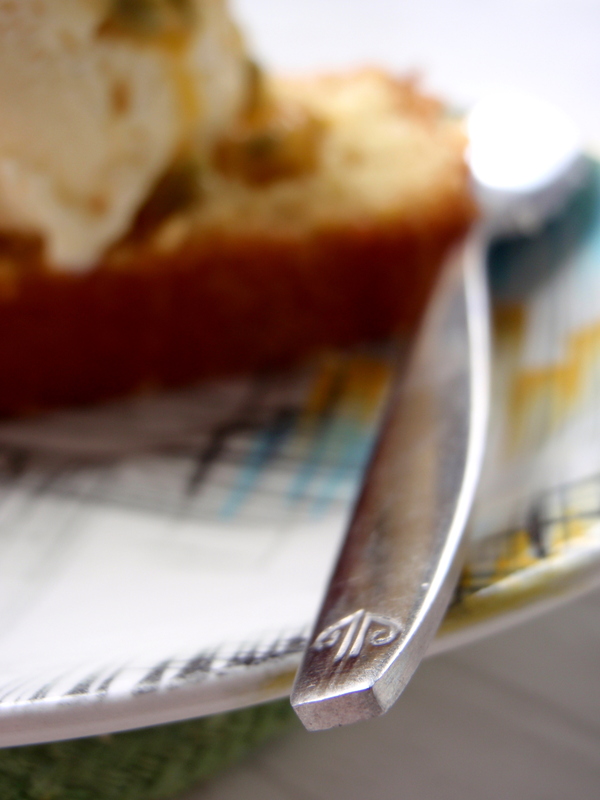 Eat with a fork – these are messy in the best possible way. *I didn’t have any leftover roast chicken. Unless you’ve had a roast the night before you may not either. So what I did was poach a chicken leg in a little pot of water along with bay leaves, a cinnamon stick, a spoonful of cumin and a couple sprigs of oregano. Once the chicken was cooked, I pulled the meat off the bones with a couple of forks and kept the poaching liquid to use for the stock called for in the recipe. Also, you could just as easily make these vegetarian by omitting the chicken and using vegetable stock, if you’re so inclined. Having grown up in a part of the Northern Hemisphere that saw bitter, icy winters with hardly a hint of life for the better part of six months, autumn in Wellington feels almost like a tease. No forests ablaze in mustard* and vermilion, no mountains of raked-up leaves lining the streets. Here we rely on subtler hints that it’s not summer anymore: a little edginess to the wind, the sun just a bit duller, glimpses of gold and red here and there. But our autumn still stirs up that sort of peaceful melancholy that sets in around this time of year, a settling-down feeling, not altogether unpleasant. I’ve been relishing it – listening to the right music (a lot of Angus and Julia Stone, can’t believe I only just discovered them over the weekend), eating lots of apples and pears, wearing tights and woolly jumpers and learning to play the blues on the saxophone. ** Melancholy, yes, but also sweetly satisfying. Autumn is full of the satisfaction of pulling fruit off vines, off trees, vegetables from the ground, the warm lingering contentment of apple crumbles and steaming cups of tea. 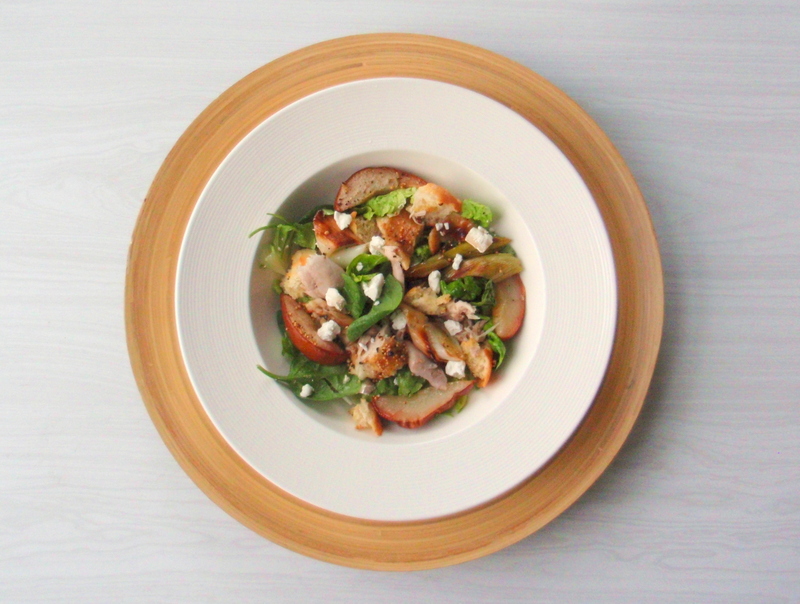 And this salad, with succulent bits of chicken, tangy goats’ cheese and tender, yielding leeks, is such a pleasure to eat it almost feels wrong. It’s not. It’s plenty good for you, and the warm, roasted pears, meltingly sweet, push this dish over the edge: bliss. No manmade dessert comes even close to the deliciousness of an unadorned, soft-ripe pear, but roasting them brings out that mellow sweetness when all your pears are firm and you don’t feel like waiting around for them to ripen. 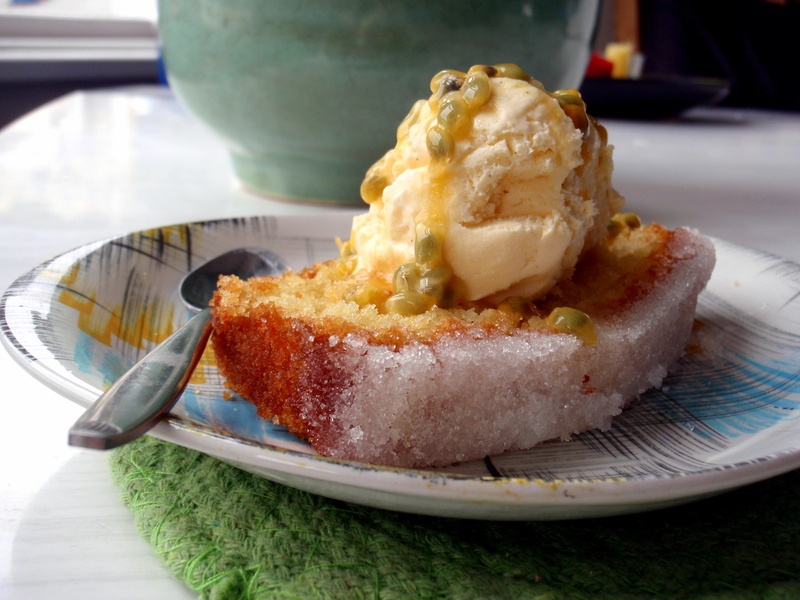 It feels a bit like cheating but the result is delicious in its own right. I had almost forgotten about how good this salad is, having made it a couple of times last autumn out of the then-current issue of Cuisine. I’m so glad I spent a few luxurious hours over the weekend curled up in bed with the cat, thumbing through a stack of cookbooks and magazines. 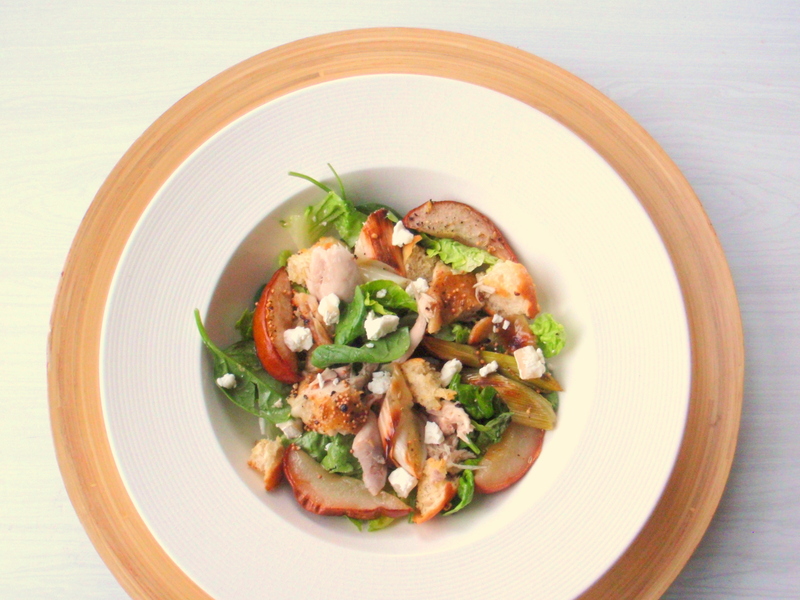 It’s the perfect salad for the weather, for the season, for the mood I was in. So make this salad, now, maybe a couple of times over the next few weeks, but don’t overdo it (it’s a little bit special). Make it when you’re feeling fulfilled and content and just a wee bit sad, make it when you’re wholly satisfied and things couldn’t be better, make it when the skies are pleasantly grey and little dead leaves are blowing across the pavement. And then don’t make it again for a whole year until that wistful autumn half-smile appears on your face again, and relish in the thrill of rediscovery. *Speaking of mustard, aside from it being delicious, I am positively lusting over bits of mustard popping up on clothes and accessories this season… am very much feeling the need-a-new-autumn-wardrobe vibe. So far, have been squirreling my money away responsibly instead… but a girl can dream. **For what it’s worth I mostly sound like a dying goose but my goodness it’s fun. And by “the blues” I mean fiddling around with blues scales and feeling very triumphant about it. 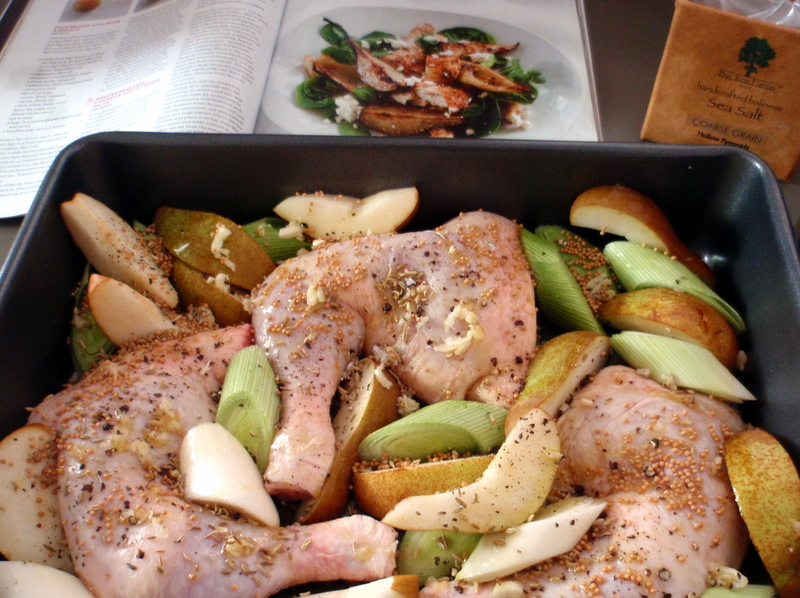 Season chicken with sea salt and cracked black pepper, place in roasting dish with the pears and leeks. Give everything a good drizzle of olive oil and sprinkle the mustard and fennel seeds and chopped garlic over everything; chuck it in the oven for 40-45 minutes until you can’t stand how good your house smells and the chicken is brown and crispy-skinned and the pears and leeks are meltingly soft. Once it’s done, pull the roasting dish out of the oven and let it sit for a few minutes. While the chicken’s in the oven tear up some ciabatta bits (or any stale bread you have lying around will do), give it a swirl of olive oil and a sprinkle of salt and pepper, pop that in the oven too, but only for about 10 minutes until it crisps up. 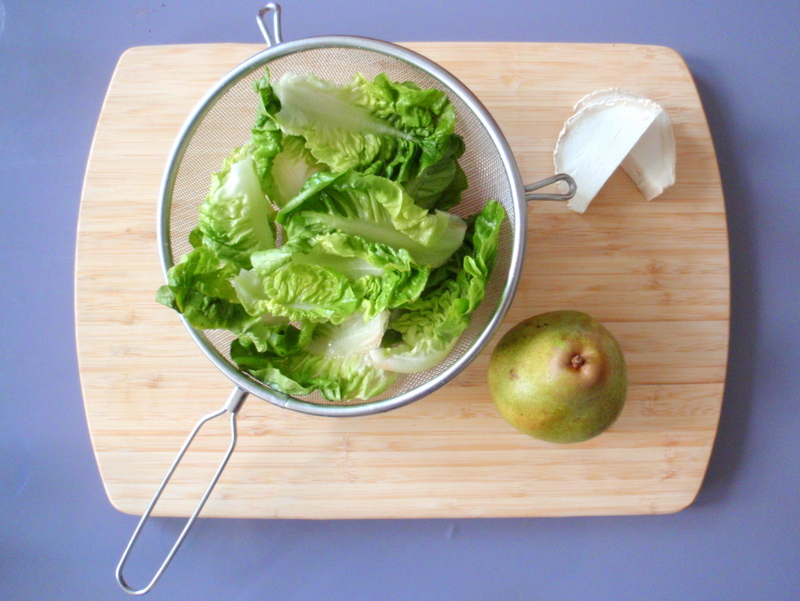 In those last minutes of waiting, get the salad ready: place the greens on a big platter or on individual plates. Remove the chicken, pears and leeks from the roasting dish, carve the chicken into big, juicy chunks, place on top of the greens with the pears and leeks. Pour off the fat from the roasting dish and heat on the stove, then deglaze with red wine vinegar, letting it bubble and mingle with the little bits stuck to the pan. Pour this over the salad, immediately sprinkle the goats’ cheese on top, and dig in while it’s still hot and the leaves are crunchy. *I used legs because I prefer juicy dark meat, but you could just as easily use breasts, a combination, or a whole spatchcocked chicken as in the original recipe. If you do this you may need to increase the quantities a bit, or just have leftover chicken. All good either way. I’ve eaten my way through the emergency kit I so painstakingly assembled after the Christchurch earthquake. Er, well, at least the edible components of it. It started on Sunday when I had this insatiable chocolate craving and broke into the chocolate macadamia block nestled beneath spare undies, torch, deodorant, canned food, toothpaste. * And then yesterday happened and I came home to the sudden unmistakable reality of having no food in the house. For the second week in a row I hadn’t gone to the Sunday market (when did I become such a creature of routine?!) and the closest thing to fresh produce I had was a half-wilted bag of spinach and the potted herbs on my balcony. And it was sort of an emergency: I was hungry, tired, things were starting to grate on me in the same way as that guy flailing (dancing?) in front of me at the last gig I went to, all shoulders arms elbows, throwing flecks of sweat my way. Rage. It’s not often an empty stomach brings forth memories of bad crowds and other small annoyances, but there you go. I’d been struck by the dreaded hangrrr Sasa so often warns about. So the need to Eat Something Now coupled with the lack of fresh food in my pantry led me to that same trusty emergency kit that had so conveniently been there for me with chocolate the night before, where I found cans of beans and tuna, and toiletries (ooh, I was running low on soap!). Score. 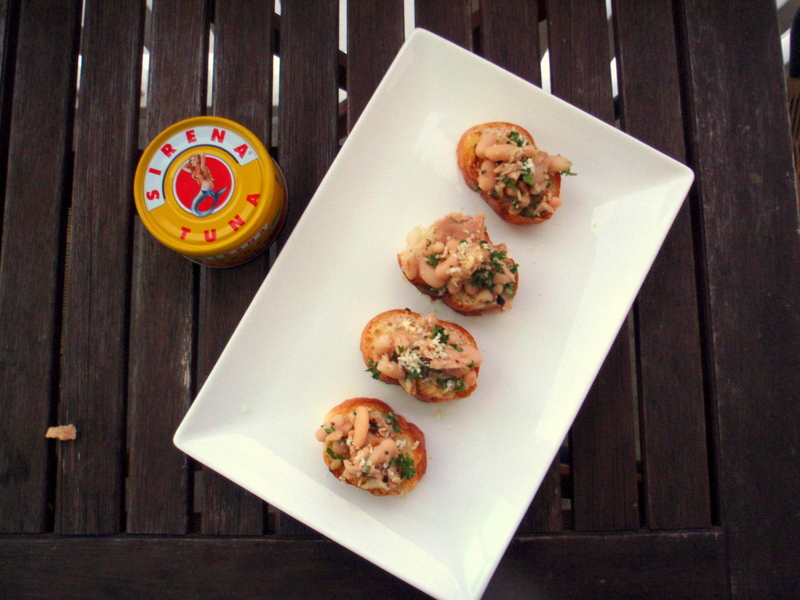 And since I always have half-eaten loaves of stale bread in the cupboard this bruschetta quickly took shape. In under 10 minutes I had depleted my emergency kit** and was sitting down to this. Crisis averted, bad-crowd memories dissipated. This is simple stuff, and you could easily play around with the components to make it fancier, but in a pinch it’s about as good as it gets. Soft, almost-creamy beans, meaty tuna, flecks of parsley and nutty parmesan, coated in this spicy-lemony-garlicky dressing that’s just as much revitalising as it is comforting. *yeah, I didn’t say my emergency kit was the best-organised. It’s basically a bag full of random stuff I hope might be useful in an emergency. Now minus most of the food. **and I realise now that 1 can of tuna, 1 can of beans and a block of chocolate is probably woefully inadequate for an emergency kit. However, it does make for a pretty satisfying meal. Heat a knob of butter and a generous swirl of olive oil in a skillet over medium heat. Thinly slice 1-2 cloves of garlic and gently fry in the butter and olive oil along with a pinch of red pepper flakes and a generous sprinkle of pine nuts. 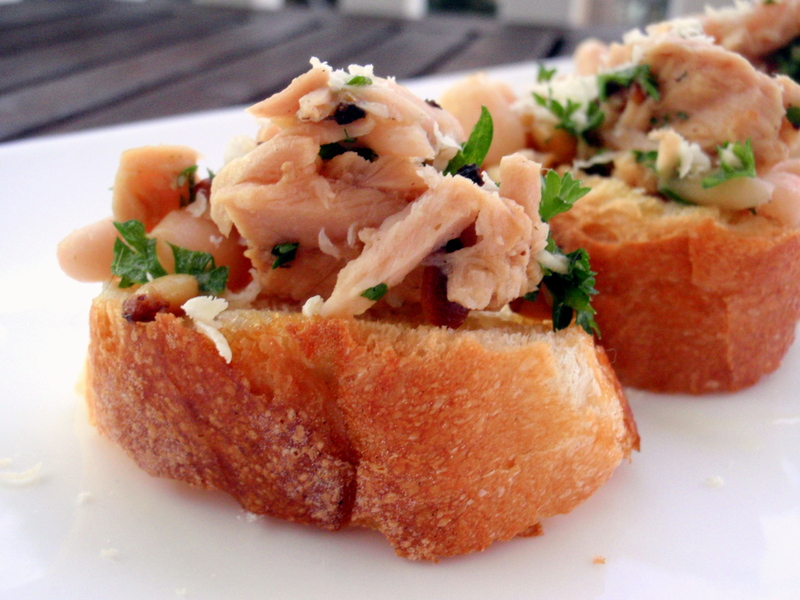 Add 1 can of white beans* (drained and rinsed), a can of tuna (drained) and a handful of chopped parsley. Squeeze the juice of 1 or 2 lemons over everything, season with salt and pepper to taste, give it a good stir so that the beans and tuna are coated with the garlicky oil. 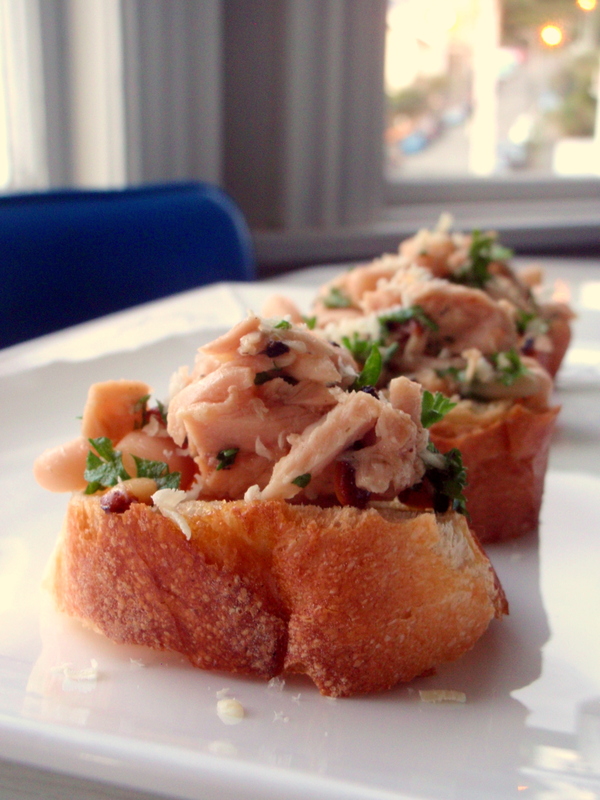 Meanwhile, toast some sliced, day-old** baguette (another way to use up stale bread in the pantry!). 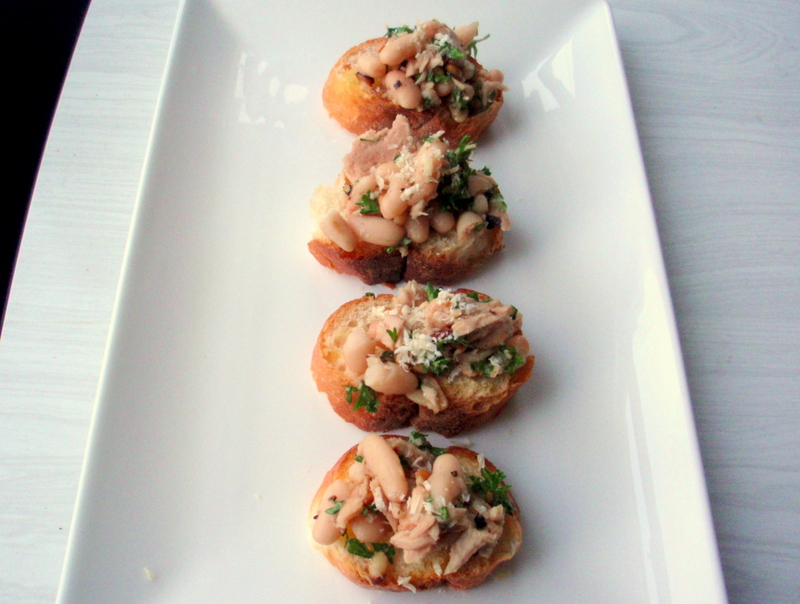 *** When it’s nice and crisp, top with the tuna & bean mixture and grate a bit of parmesan over the top. Easy! **Ha! Feel free to take a liberal reading of this. 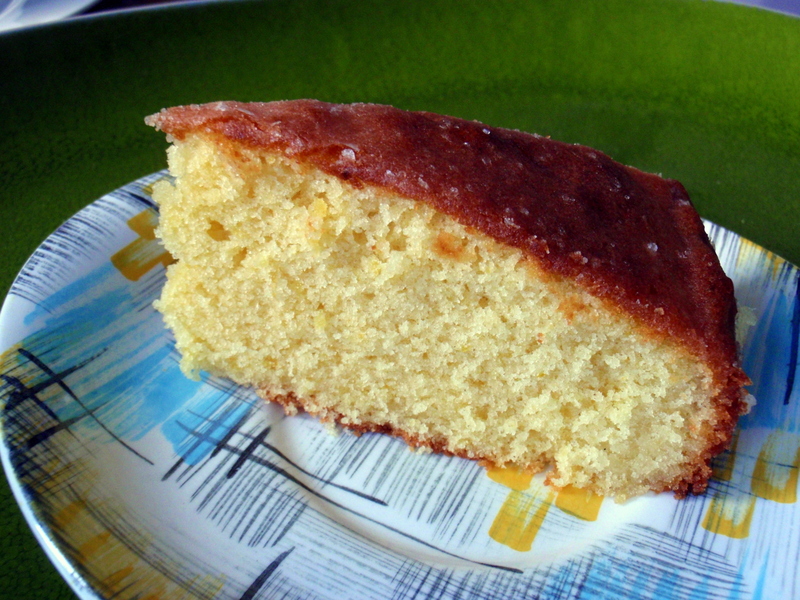 The bread I used was way more than a day old… I wanted it nice and crispy, so stale was fine. ***I’m forever burning stale slices of baguette in the toaster so I usually do this in the oven, with a drizzle of butter on top.